Yes, I finally have pillows now with my art, because you people keep asking for them. They're fairtrade and environmentally friendly produced, and they are super high quality, both the filling and cover are made of 100% polyester fiber. You can remove the cover with a zipper if you want to wash it, so it's super handy. I have them available in many different sizes. Like all of my products, they are stocked in a smoke-free (I'd never smoke anyway, yuk!) and animal-free environment, so people with allergies don't have to worry. They come sealed in their original packing. Please keep in mind that because these are fairtrade produced, I can't lower the price. I hope you understand. You should put that on a journal, I'd buy it! 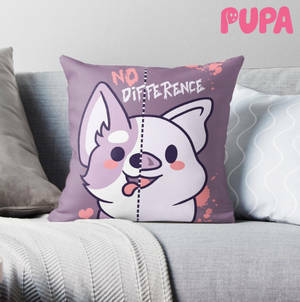 EDIT: Done: My pillows, t-shirts and artbook available now!I present to you: the new artbook and merchandise of my art that's available now! Suitable for both piggies and doggies to curl up on.